Little Things, a cutesy place for those of you with a sweet tooth has an outlet in Himayathnagar. Go here with your squad, bae or kiddies and enjoy some toothsome cake jars and snacks. 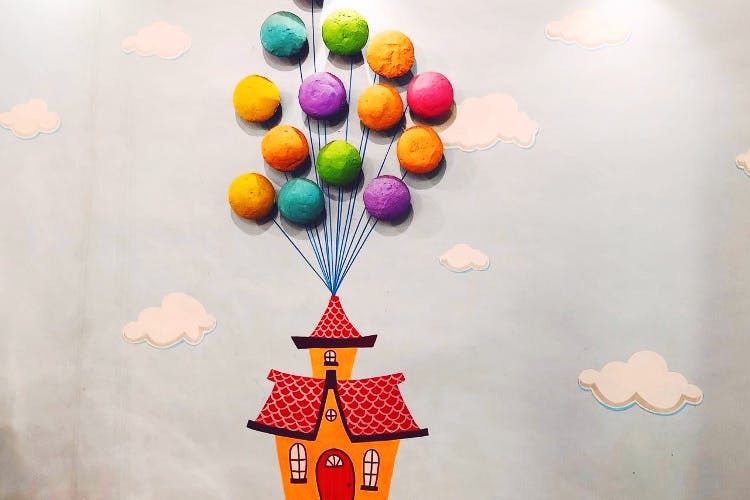 Although tiny, this place is done up very well with Pinterest worthy decor like faux cupcakes as balloons, jars used as hot air balloon baskets, posters hung using quirky pins, vibrant little windows, miniature chalkboards, wooden easels and chopping boards on display. It is made cosy using warm lights shaped like jars (and a yo-yo shaped light) hanging from the ceiling. The cake jars are absolutely tempting, and you get to taste samples of each of the flavours so you know exactly what to get. They also have cakes, pastries, desserts, and snacks. After tasting a spoonful of each of the flavours like Chocolate Caramel Mudpie, Banana Banoffee, Nutella Cheesecake and more, we decided to go for the Nutella Cheesecake Jar, a dark chocolate mousse and we ditched the pasta/burgers to get Spicy Maggi Panini. Spiced Maggi in a bun? Yes, please! Topped with buttery goodness and served with a fine jalapeno cheese dip that our hungry stomachs did enjoy. The Nutella cheesecake had creamy layers that bonded well with our taste buds, and the mousse was a warm hug in a shot glass, but it could’ve been moister. The serving is true to the name and comes in little quantities, but it is the ambience that makes this a nice place to hang out. Not too crowded, not too noisy — just how we like it! You also get a variety of coffee/flavoured tea, red wine sangria, and quick bites like croissants and butter cookies. Plus, you can also check out their outlet in Madhapur or call to order in customised cakes.